A few days ago, I came across an interesting post by Aswath Damodaran on the $19 billion Facebook-Whatsapp deal. For those who aren't familiar with him, Aswath Damodaran is a Professor of Finance at the Stern School of Business and is one of the world's leading experts on valuation. First off, I have tremendous respect for his work and I could never hope to match his knowledge about the world of finance. That said, I do understand asymmetric competition and this post truly shows how futile traditional valuation methods can be (especially discounted cash flow) when valuing acquisitions that pose such a threat to an incumbent. Let me start with an (overly) simplistic explanation of discounted cash flow (DCF) valuation for readers with a non-finance background. A DCF analysis begins with a 3-5 year forecast of the company's cash flows (based on certain assumptions) and a "terminal value" at the end of this period. This terminal value is either based on an assumption of steady state growth of 4-10% or a revenue or earnings multiple. To get to the current value of projected cash flows, these figures are then discounted by the "cost of capital" or opportunity cost, i.e. the return one could expect if the same funds were put into an alternative investment opportunity with a similar risk profile (e.g. : alternative acquisition/investment, stock buyback, etc.). The value may be in the form of advertising revenues from Whatsapp’s users but that will be tricky. Now, this may be a good way to value Whatsapp as a standalone entity. Because of their conservative business model, their intrinsic value is unlikely to even cross $1 billion. The problem here is that he assumes there are just two ways to monetize Whatsapp even after the Facebook deal - 1) Subscription (the current, subpar model), and 2) Advertising (unviable for a messaging app). 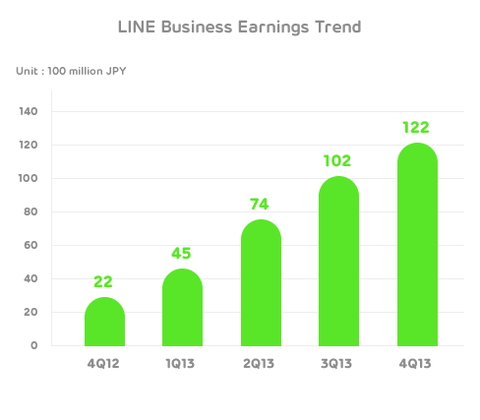 In less than 3 years, LINE's annual (2013) revenues reached ~$340 million, more than double the $153 million that Facebook generated at the same point in its lifecycle (2007). In Q4 2013, LINE's annual revenue run rate reached roughly $480 million, far more than Facebook's $272 million full-year revenue in 2008. This clearly shows that the scale and monetization potential of mobile services is unlike anything we've seen before. For Facebook, the path to success with this deal is therefore simple, albeit not easy. Start by trying to attract Whatsapp users to the Facebook ecosystem, and hope and pray that the market's focus stays on the number of users for the near term. Follow up by trying to monetize these users, with advertising revenue being the obvious front end but perhaps other sources as well. What's the problem here? Facebook's goal isn't to increase its user base by attracting Whatsapp users as the overlap could be anywhere between 80-100%. Their goal is to lose engagement to Whatsapp (a monetizable, company-owned asset) rather than to LINE, WeChat, KakaoTalk, etc. The most important point here is that nearly all traditional valuation ignores is the "cost of doing nothing", i.e. it assumes that a company's financial prospects remain unchanged if status quo is maintained. Let me give you an extreme example -- In 2008-09, Nokia and RIM/BlackBerry did nothing to respond to the disruptive threat posed by the iPhone and Android. Did their respective projections/valuation take the cost of inaction into account? Their sky high market caps and subsequent collapse over the next few years suggest the answer is no. Facebook's entire advertising-based revenue model is based on user attention. If Facebook passed on this deal and continued to lose engagement to modular social apps, what would be the impact on Facebook's financials and valuation? Without understanding that, how can we really differentiate between the value of Whatsapp as a standalone company (which Aswath Damodaran did a terrific job of breaking down) and the value of Whatsapp to Facebook? Therefore, it isn't as important to measure Whatsapp's break-even income, as it is to gauge the potential loss to Facebook's income (vs. projected income) from not owning Whatsapp. With the rise of smartphone platforms, the modularization or unbundling of social has become increasingly clear. While it is still unclear whether the dynamics on mobile favor a fragmented market or "winner-takes-all", it is clear that network effects are extremely strong. Does this mean that Facebook needs to buy every single social app out there? No, but they do need to buy into (or create) different categories of social apps (each with a different benefit) that could threaten user attention. For example, the job that Instagram does is "share my photos with the world". That's very different from the job a messaging app does -- "privately communicate with people I care about". Owning Instagram didn't insulate Facebook from the asymmetric threat of modular messaging. However, owning Whatsapp allows them to directly compete with the LINEs and WeChats of the world. As a result, the strategic dilemma is managed and the onus shifts to execution. In closing, let me leave you with this thought -- Assuming it was viable, imagine what BlackBerry would look like today if they bought Apple in 2008 and let them run independently. While that analogy is far from perfect, it does get my point across.